A huge grin covered my daughter’s face as she pressed the pump on the spinner over and over again. Pink, blue, and green swirled together to form a blurred rainbow. She was loving her first experience with spin art, and she already had an idea of what she wanted to do with her finished product. 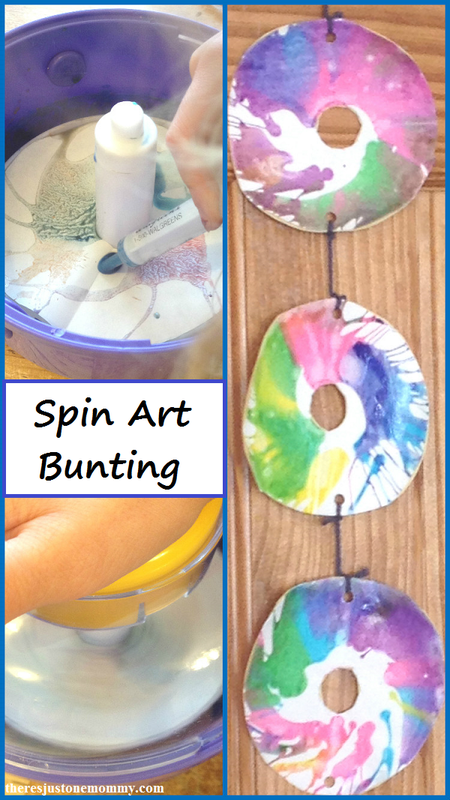 She used it to create a colorful spin art bunting that now hangs proudly in the kitchen. She had so much fun with this kids craft that we just had to share it with you. Spin art is fun for kids of all ages. Teach younger children about color mixing by using 2 primary colors and discovering what happens when they get swirled together. Preschoolers will enjoy the physical act of getting the spinner to move, whether your spinner has a hand pump or a crank to turn. Older kids will have fun creating colorful works of art, which can be used to make greeting cards, wrapping paper, or this colorful hanging bunting decoraton. Place your white paper into the bottom of your spinner. If your paint is not in a squeeze bottle, use an eye dropper or syringe to place several drops of paint onto your paper. Make sure the lid of your spinner is on securely, and spin. We tried 2 different types of paint in our spin art. First we tried our homemade liquid watercolor paints. Since this paint is watery, I stirred a bit of flour into each color of paint to thicken it. 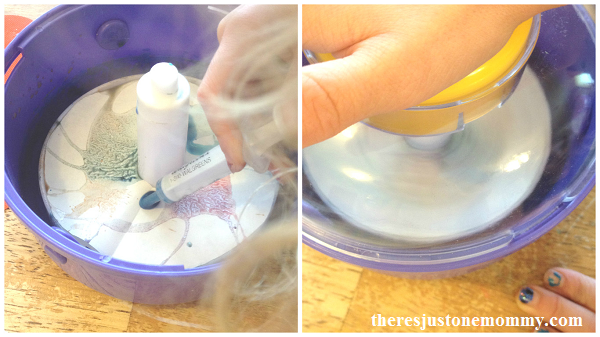 This kept the paint from soaking into the paper right away, allowing the colors to swirl in the spinner. The second paint we used was an acrylic. Both turned out pretty, but I really love the vivid colors we got with the acrylic. 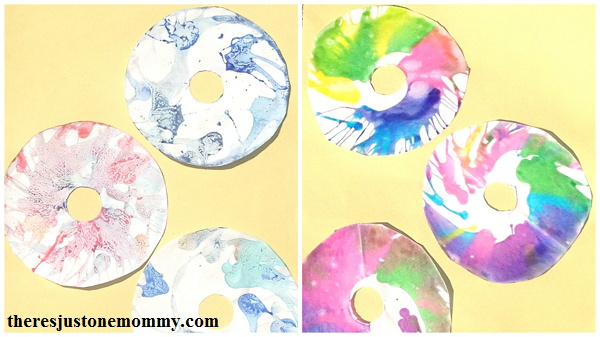 Let the spin art dry thoroughly before displaying. You can hang them as is, or you can challenge your child to come up with a way to use their artwork. If you do the spin art on square paper it can be folded and used as greeting cards. Because of the way our spinner works, the paper is circular with a hole in the center. 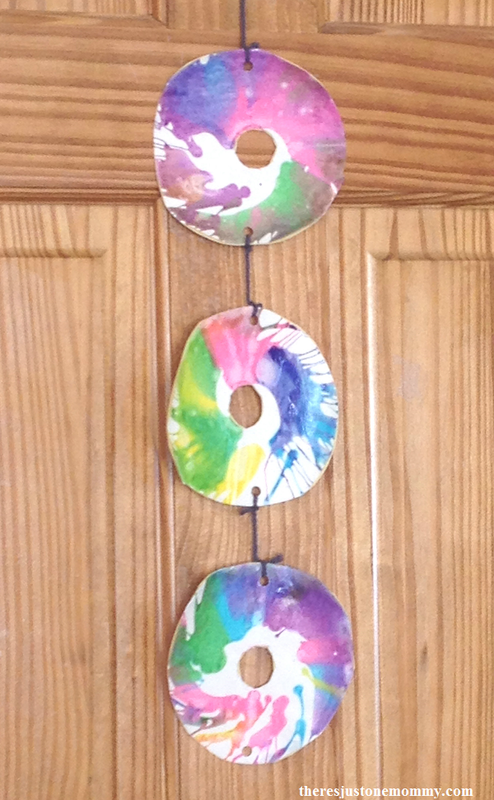 My daughter decided it would be neat to tie the circles together and hang them that way. I love how the spin art bunting looks hanging on the door. When my daughter finished, my son had lots of fun hitting that pump and making the paint spin for his own colorful spin art bunting. I definitely think we will be having more fun with spin art in the future. I can see why your daughter loved this activity. It looks like so much fun, and an added bonus to play with “gadget” like the spinner. Thanks so much for sharing this neat idea with us on #shinebloghop this week!